Picking a featured game for our comeback issue after such a long break was never going to be easy. 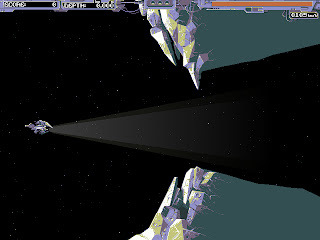 With several superb releases to choose from, I was really struggling to select a worthy game to highlight - and then out of the blue I received a message from acclaimed pixel-pusher Ptoing announcing the launch of ThrustBurst; the debut PC title from new independent development group Umlautgames. Now I'm probably going to be flamed by the rest of the RGCD team for saying this, but despite the competition, ThrustBurst is undoubtedly the best game I've played so far this year. I'm well aware that the cave-flier/Scramble concept is far from original, but nonetheless ThrustBurst really shines and it's obvious from the stunning attention to detail and rich atmosphere that it has been lovingly crafted by a team of established indie-scene veterans. From the outset, ThrustBurst epitomises all things retro. 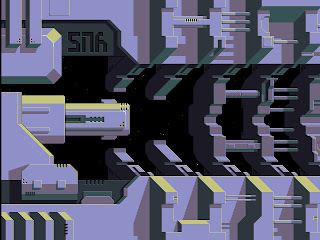 Helm and Ptoing's artistic influence in the design is particularly evident; the limited pastel palette and stylish visuals are reminiscent of their recent high-resolution C64 productions and the game features a mix of perfectly pixelled animated sprites working in harmony with a minimal angular backdrop. Likewise, the SID soundtrack and lo-fi effects by Ghormak and Darkstalkey add to the vintage atmosphere - and happily the top-notch presentation is matched by the quality of Fuzzpilz's code - Thurstburst is a well-constructed, fast little game that runs smoothly and packs enough features into the minimal file size to keep you occupied for many hours of game time. Oh, and please note that when I say many hours, I'm actually referring to the time it will take for the average player to master the game; describing ThrustBurst as challenging is huge understatement - it's insanely difficult. There are no lives, no hitpoints, no continues and no checkpoints - you have one ship and 50KM of alien infested and highly volatile terrain to cover. 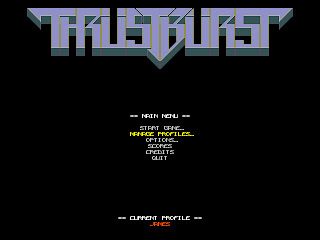 Luckily though, the difficulty is offset by the fact that ThrustBurst is officially more addictive than crack - once you've played it a couple of times you will not be able to put it down - and when you do you'll soon be back for another round of punishment. If you've played a cave-flier before then you'll know pretty much what to expect from ThrustBurst, although Umlautgames have made things a touch more complex by adding a few nu-school game mechanics and a generous helping of Konami's Scramble to the tried-and-tested formula. 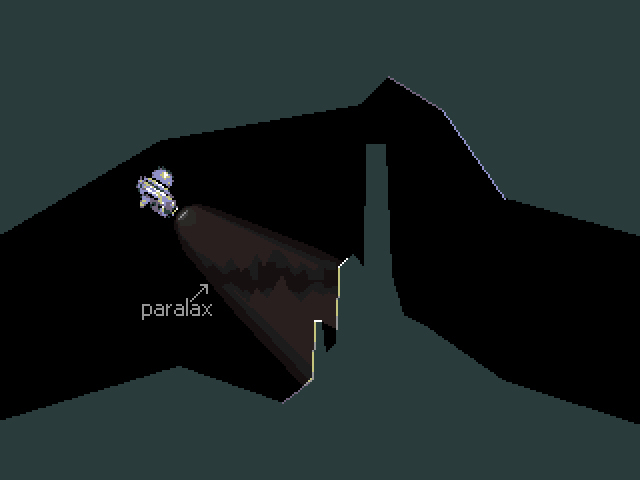 The player's goal is to navigate their gravity-influenced craft through a randomly generated two-dimensional tunnel, avoiding the walls and environmental hazards (such as the formidable geysers), destroy the aggressive alien defences and eventually reach and detonate the asteroid's core. This leads to another problem; to complete your mission you'll need to reach the core with a fully charged generator. 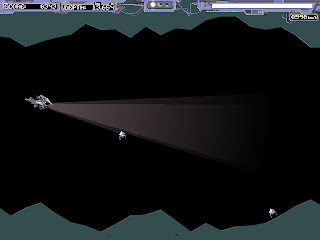 Unfortunately, using your weapon and shield systems drains your pitiful energy reserves at an astonishing rate - and the only way to recharge is by 'grazing' the tunnel walls, making it necessary to laugh in the face of danger and grind along the sides of the cave with a safety margin of a few pixels for comfort. Add this to the mix of positively OTT and trigger-happy enemy attack waves, one-hit-instant-death game-play and some frustratingly tight channels to traverse and you'll get a basic idea of exactly how tough ThrustBurst is. 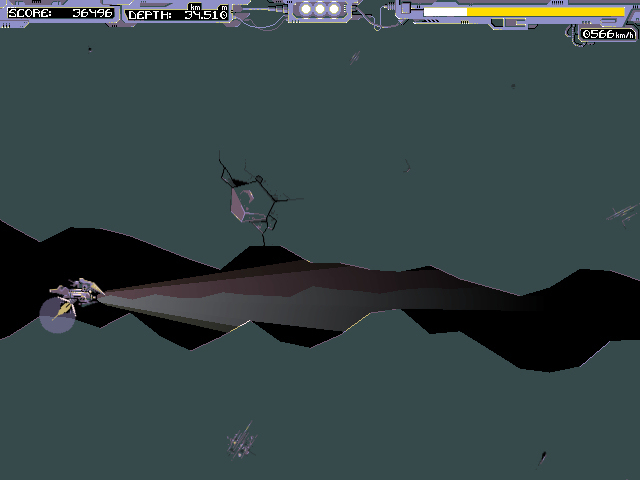 However, regardless of its steep difficulty, ThrustBurst is maddeningly addictive and hugely enjoyable to play. The randomly generated terrain means that no two sessions will ever be the same, and the neat little extra touches (like the awesome launch sequence, impressive particle and lighting effects, danger assessment LED's, combo kill bonuses, player profiles, stats and medal awards) really make the game stand out from its peers. There's even a fully customisable practice mode (using old-school arcade-style vector graphics) and a hidden easter-egg mini-game that I've yet to discover. In all, ThrustBurst has set a new standard for cave-fliers, and it will be interesting to see if Umlautgames can match the quality of this spectacular and highly polished debut release in their future productions. Download the game here (from the Umlaut Games website). Deep down, you always know it's your own fault when you die - the game design is just about spot on and that's what will keep you coming back. It's huge, difficult and will take an age to get through, but it's never unfair, and the tantalising prospect of getting just that little bit further and adding that little bit more to your best score will mean you can never stay away for long. It's genius, basically, and mere words cannot do it justice, so grab hold of it and prepare to wave goodbye to your life for the next three decades. Well now! Seeing as James left an open invitation for flamage, the evil side of me would love to make use of the opportunity by throwing the literary equivalent of a few molotov cocktails around... and yet, I can't fault all that much of what he's said. Umlautgames have created a modern masterpiece. The presentation and gameplay work together really nicely to create a cave flier that will be talked about for a long while. Undoubtably ThrustBurst's catchphrase should be "Crashing into cave walls has never been so much fun!" - but put simply, it's just too hard for my taste. I mean, a game can have the most eye-dazzlingly awesome graphics, ear-popping audio and drug-like addictiveness - but if it's effectively impossible for some people to beat, what's the point? Frankly the difficulty level here is plain off-the-scale bonkers. I can see a lot of folks being put off because of that, which is a shame since ThrustBurst offers a lot of enjoyment to those who are persistent enough to keep playing through the inevitable frustration of clipping too much of the cave floor for the 73rd time. Yes, I know retro games were often quite hard and there's a trend in recent times to create even more absurd challenges (I'm looking at you, Hell Temple of La Mulana) - but this takes the biscuit. All this game needs are some ways to make itself more forgiving, like unlockable starting points further into the cave or a selectable number of lives, then I'd be much happier in agreeing with James. Reading back through this I realise I sound pretty negative, which isn't very fair to ThrustBurst's quality. Its overall nails-ness is honestly the only grudge I have against it; everything else is excellent. Give it a try and see if it grabs you, because if it does, you're in for a rollercoaster ride! [Helm] I am Helm. I am 24 years old, I am from Greece. I had this game idea one day and made Fuzz start coding it because it seemed like a small and fun game to do. I made the initial mockups, most of the preliminary art and co-designed the thing from there on. [Ghormak] I am Ghormak. I'm 24 years old and my most apparent contribution to TB is non-secret music and a few sound effects. Other than that, I test and contribute with ideas, design and testing like everyone else on the team. [DarkStalkey] Hello! I am DarkStalkey, which is a rubbish internet name but I'm stuck with it now as I've been using it too long to change it. I did the most of the sound in ThrustBurst, as well as playtesting and general suggestions. I am one year younger than everyone else, apparently! [Lackey] I am Lackey, also 24, Canadian, pixel artist. I did the 'additional art' which in this case amounted to very little (and emotional support). [Fuzzpilz] I'm an undergraduate student of mathematics in Germany. I am 24 years old and boring and mostly just do the coding. [Ptoing] I am German, by the way, if that accounts for anything. [Ghormak] Oh, and I'm a Finn and a computer science and engineering drop-out. [Helm] And I am a comic artist by trade, I guess I should mention! [DarkStalkey] Oh yes, I'm also from England and I make games for a living. [Lackey] I took art history and I'm unemployed. Well, mostly. [Ptoing] I mostly just sit around and try to get some art done. 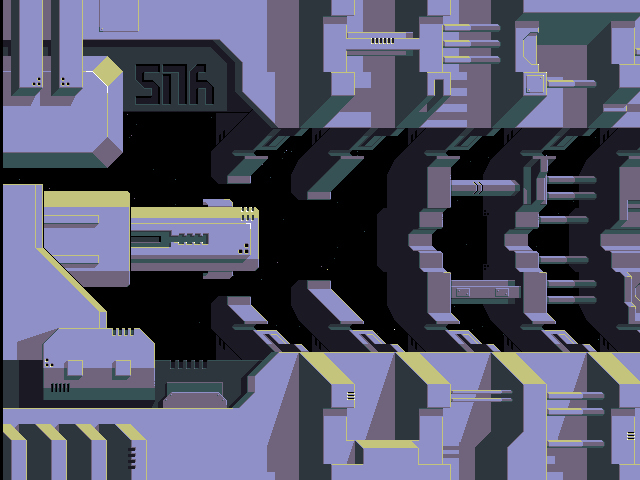 Freelancing pixelart for a living at the moment. [Lackey] I do this too. [Helm] I am also doing pixel art for a living between comics. And what about your C64 stuff? You (Helm) and Ptoing have built up quite a reputation on the Commodore Scene Database for your acclaimed artwork. [Helm] We have? I am no longer active on CSDB. [Ptoing] I grew up with one, got it when I was 8. I kind of rediscovered it for its graphic capabilities (which I find interesting) in late 2003. [Helm] I love, love, love the C64 - it's my favourite 8-bit home computer. [Ghormak] The C64 was my first taste of computers too. [Lackey] Helm, I thought you never had a C64? [Helm] I never did, Lackey! I've played around on them only at friends and family houses. [Fuzzpilz] I never had a C64, although a friend did. Personally I grew up with PCs from the start. [DarkStalkey] Being younger than everyone else, I started out with an Amiga, but love for the C64, mostly the SID chip, came later. [Helm] My first computer experience was playing Barbarian on a monochrome monitor C64. [Ptoing] I think this also shows I am the oldest here. Again. [Lackey] You are our sage. [Helm] Try to stand, old Sven. [Ghormak] I taught myself English by playing terrible text adventures on the C64. Good times. One last bit of info before moving on to the next question - how did you all meet up? OK, give me the condensed version. [Helm] Should I do it? [Lackey] Probably, you're the most qualified - you are responsible for me and Ptoing. [DarkStalkey] You were the first AGSer. [Ptoing] Yeh, helm is connected to everyone. [Ghormak] Go ahead. You're the one belonging to both groups from which we all... uh.. 'originate'. [Ptoing] Helm is writing some epic story now. About glorious battles and conquest. [DarkStalkey] Chris Jones has a lot to answer for, really. [Helm] Okay, basically we come from an amateur adventure game background. Most of us first met at the AGS (Adventure Game Studio) EZboard. AGS is an amazing program created and maintained by Chris Jones. You can make point and click adventure games with it. We all were trying to make our own adventure games with variable degrees of success, and we enjoyed each others' company on the message board for a few years. Then we met in person on the IRC channel, and later on splintered away from the AGS scene a little bit, but the friendships, solidified through AGS-related real-life meets, became stronger. [Ptoing] I was not part of all this yet though - AGS that is. I came in sideways. [Helm] Yes, I met Ptoing and Lackey through Pixelation and related sites. Real life meetings? All of you? [Helm] Yes we've all met in real life. [Ghormak] But unfortunately no group photo exists. [Helm] Continuing with the story... I introduced them to our company of internet friends and they've gelled well, and we've met in person with them too, so on. We are real friends, not work associates, not hired help. [Ptoing] Yes, the whole team and some other friends met in Finland last year over New Year. [Fuzzpilz] It wasn't really an Umlaut meet so much as a meeting of a wider group of friends that includes us - Although some work on ThrustBurst and our other current project got done. [Helm] Yes we like to think we get together to WORK ON THE GAME, but it's a sideways thing. Your website states that the main inspiration behind the game was Bas de Reuver's Urthworm, but really ThrustBurst is so much more than a mere clone/update. What were the game's other influences? What inspired the atmosphere and visual style, for example? (I'm guessing the C64 was the influence behind the choice of palette). [Lackey] Helm likes those colours. [Ptoing] Helm should answer this one too, really. [Fuzzpilz] That's a question for Helm, mostly, he's the one who started it and provided the initial mockups. [Helm] First of all, what might not be really apparent when someone plays TB as an end product today, is that it really was more or less an Urthwurm clone along with a few new bits and pieces in the beginning. This game was the result of a constantly evolving design. We just made new aspects up if and when the old ones were in place and working. This sort of design method does not suit story-driven games and such, but is perfect for coffee-break games like TB. Do any mockups still exist? [Helm] Yes, they do, I will try to find and send you stuff after the interview. [Helm] Essentially, the game came together well just because the people involved - and especially Fuzz - had a good sense of implementation of random ideas, what works, what doesn't, how to change it to make it work. [Ptoing] The whole thing was a VERY organic process. Especially considering we never used a design document. [Helm] Now, on the case of atmosphere and aesthetics, I like desolate and stark videogames, usually confined spaces and lonely sci-fi. Out of this World (Another World) is a big influence. I'm sure I'm not the only one. The colours are very few, like about six colours in all the initial pixel art for it. The reason for this is pretty simple - fast asset creation to give to Fuzz for him to put in the game. [DarkStalkey] Out of this World is one of my favourite games from that era. And what about the new-school game mechanics, like the wall scraping, medal awards, etc.? [Ptoing] The scraping was my idea, like for points. And then Helm suggested that we use it for energy as well. [Helm] Oh that probably comes from the love for new-school manic shooters that I share with Ptoing. [Ptoing] It was really just the result of bouncing ideas around. It certainly sounds like it was an organic process of development. [Helm] Yeah, a constant work-in-progress, steered by a pretty simple design vision. [DarkStalkey] Everyone's enthusiasm fuelled it along really. We mostly made the game in two weeks I think. [Ptoing] I think the fact that we had long pauses in development actually helped in the end, because we could get some distance from the game. [Helm] Hm, perhaps. But the game didn't really change drastically after the long pause, I'd say. [Ghormak] Yeah. All of us except Lackey met up in Germany two years ago, and the game came together in that week, pretty much. [Ptoing] I would say actual time worked on it was probably one month at most. [Lackey] And there was a long period of "Is ThrustBurst done?" [Helm] Back to the graphics, originally I was thinking I'd put tiled rocks in the whole of the cavern, but I found it looked bad with the uneven contour crops, if you picture it in your head you'll see what I mean. I always meant to go back in and make more wall detail decals, but in the end it's probably for the best that I did not. I totally agree. I think that what you've done looks amazing. The extra effects such as the earthquakes and geysers, etc. give the game a rich atmosphere - as well as making your mission even more difficult! [Helm] Haha - that's all "Oh would that be cool, Fuzz? ", and then Fuzz makes it cool in 10 minutes. This sort of game design process, without someone as skilled as Fuzz would be a catastrophe. [Ptoing] I could not agree more. Fuzzpilz, do you code professionally, as in on a freelance/self employed basis? [Fuzzpilz] Nope, as I said I'm an undergrad mathematician. Anything professional would be basically fulltime I believe, so isn't really an option. However, I've done some audio freeware that has been relatively well received. Can we have some examples of your previous work? [Helm] Come on Fuzz, pimp your stuff! [Fuzzpilz] I've made a bunch of plugins for a freeware modular tracker called Buzz, as well as a handful of other audio plugins, such as the VSTi synthesizer Oatmeal. None of it is really that amazing, but it's gone over okay. What development tools were used to create the game? [Helm] Cosmigo Pro Motion for all the pixel art. [Fuzzpilz] C++. The ide I used is visual C++ 6 because that's what I'm used to. ThrustBurst is a terrible mess of Windows SDK, OpenGL and so forth - our next project uses SDL, which means it'll be less buggy in it's interaction with the OS and easier to potentially port. [DarkStalkey] I did all the sound design in Cubase with a SID emulation VST. It was all pretty much 'make a sound quickly, render it out, send to Fuzz to put in the game', on the fly stuff. [Helm] It was mostly done in two weeks of feverish IRC back-and-forth! [Fuzzpilz] Most of it was done in the initial two weeks or so, over IRC. Then various small changes were made at intervals every few months (also over IRC). [Ghormak] For music, I've been making C64 SID music for fun for quite a while, and since it'd have been a hassle to integrate a SID emulator Fuzz awesomely wrote code that plays Goattracker songs directly. Also, we kind of wanted to use this to make it easy to have the three channels of audio go out of synch with each other to create (almost) endless songs, but it turns out making (good) music like this is quite difficult so it wasn't done much! It happens in one of the 4 tunes that comes with the initial release. That's really clever, but it is still a shame that SID isn't supported. If it was the people could easily have made their own soundtracks for the game by dropping their favourite SID tracks into the 'mus' directory. [Helm] Can't you still do this? [DarkStalkey] You can do it with Goattracker .SNG files. [Ghormak] Yes, but you can't put their favourite Ron Hubbard songs in the game. [Ghormak] We're not sponsored by Scientology, honest! [Lackey] I always do that. [Fuzzpilz] The reason this isn't the case is that writing a proper SID player basically means writing most of a full C64 emulator, and I didn't want to use somebody else's SID playing code for licensing reasons (and because it was actually easier to do this way). Why was ThrustBurst in development hell for so long? On your site it states that the game was 85% complete, then left for a year and a half. Was it difficult returning to the project and picking up the pieces, and is there a story behind this? [Helm] Fuzz should answer this. [Fuzzpilz] There isn't much of a story, it's just that what with one thing and another, we were always waiting for somebody to get this or that done while they were busy with work and so forth. [Helm] We also started making our second game without being done with the first one. [Fuzzpilz] Actually we started our prospective third game, then stopped it and then started the second one. [Ptoing] Yes, that was a wise decision. [Helm] well 'nei...n....', the second game was sort of a side-project I had burdened another friend of ours with but who didn't find the time for it, and I asked Fuzz if he'd like to do it before our 'third' game, since they were similar and there'd be things to learn from it to use on third game (true) and also, 'it seems like a small and easy game to make' (never true). So there's no specific reason, just usual real life stuff? [Ghormak] Yeah. No interrupting wizards and orcs or anything, sorry. [DarkStalkey] Real life is the ultimate foe. [Fuzzpilz] Actually that's a lie, we were constantly menaced by lizardmen. [Helm] Oh but I guess Dwarf Fortress hampered productivity in a very real way! Were there any features that you initially wanted to include but didn't make the final cut? Is there an enhanced version of ThrustBurst in the works? [Fuzzpilz] There's one extra tune already done, and of course we've fixed some bugs and are working on some improvements to joystick/gamepad support. Not much left to do, should hopefully be done soon if coursework doesn't kill me first. [Helm] I had planned for some hand-crafted parts of the caverns that would be difficult but rewarding to navigate that I always forgot to tell Fuzz about... We wanted the background parallax caves to foreshadow what you'd have come your way in the playing field, which I thought was very clever, but that was cut... What else? [Ptoing] The biggest thing we left out was an online highscore table, I guess. [Helm] Oh yes, that! We need to do that. [Fuzzpilz] Yeah, we're hoping to do that soonish also. [Ghormak] At some point there was talk about having the music change according to the Perilscope status. There wasn't much superfluous design. We left in pretty much everything we tried, I think? [Ghormak] It's worth it for the pun. [Fuzzpilz] It's supposed to give you some sort of hint of how dangerous the upcoming terrain is, but it doesn't really help much. We left it in because it doesn't harm the game and looks nice. [Ptoing] There are other things missing as well, like hints for the medals. [Helm] Actually I feel (and I'm largely alone in this) that games like TB shouldn't hold your hand in finding out all the extra stuff in there. We want there to be a sorta oldschool word-of-mouth effect on how to get unlockables and extra stuff in the game. [Fuzzpilz] Well, the hints will be cryptic. [Ptoing] Written in Esperanto as well, for futher challenge. [Helm] It's mentioned a bit in the readme. You just have to play around, most types of play are rewarded with medals! [Ptoing] Even doing stuff wrong. THAT's how nice we are. [Helm] Oh yes, ThrustBurst is very nice to people. [DarkStalkey] It's nice until you fly into five turrets and three hoppers, dodge them gracefully and then get geysered in to a stalactite. [Helm] I hit myself when I lose in TB. As a result of ThrustBurst's popularity, will the game be ported to any other platforms (Mac/Linux/Xbox, etc.)? On a related note, in an ideal world (where the time and resources required to learn new languages/recode the game/etc. were freely available) what would be your preferred target platform for ThrustBurst? [Ptoing] It runs perfectly fine in WINE, which is a nice incident. [Helm] TB is perfect for any sort of capable handheld. [Ptoing] As long as it has a high enough resolution. [Helm] Nintendo DS or somesort. [DarkStalkey] It'd be nice on the DS I guess. Which is the same as my nickname initials, so that makes it kind of... uh... yeah. [Lackey] DS would be neat, you could tap and drag to do lasers and the entire top screen could be a Perilscope. [Fuzzpilz] Haha, with 128 lamps for extra detailed peril information! [Lackey] Actually, I'm sorry - my hand cramps just thinking about that. Although a portable version would be great, I think TB really benefits from a large screen. [Helm] I think smaller resolutions can work if all the art is remade smaller. [Ptoing] Yes, would work probably, but the high resolution helps. 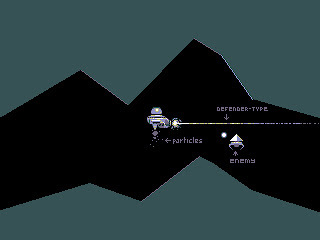 [Ghormak] I would like to see TB on the C64 24 years ago, then we could have made some money! [Lackey] We're all terrible time travellers in a way. [Helm] As far as the pixel arts go yeah, born in the wrong decade. [Ptoing] Truer words never spoken. C64 would be fun. It would also be fun on something like the Dreamcast. [Fuzzpilz] I'm actually happy playing it, and anything else, on the PC. I'm very much a keyboard(-and-mouse) person as far as control schemes for games are concerned. This is why the gamepad support was initially so half-assed - I don't own one myself and have little interest in playing with one. That sort of personal bias leads to problems sometimes. [Helm] I believe the actual quote from Fuzzpilz was "Keyboards and mice are the way to play games on PCs and you cannot dissuade me from this." [Ghormak] Assuming time travel doesn't exist (a reasonable assumption I guess), I'll have to side with Fuzz really, I'm quite happy using the PC as a gaming platform. But I'd be happy to see it on as many platforms as possible of course. [Fuzzpilz] I think a Mac port could be fairly easy if I had a Mac, actually. But I really don't want to burden anyone else with the horror I created. [DarkStalkey] I'd be more keen to make more games than spend time porting. [Ptoing] I think the best thing to do is fix it up for the PC and then leave it and go on to new adventures. [Helm] Yes, given that we have a new game half-finished. [Ptoing] No promises. I think we're 50% done with the current game, but the nature of how we make games can't really depend on deadlines. [Fuzzpilz] We don't know how long it'll take. It's unfortunately likely that it'll be a while. [Ptoing] Yeah, we do not know how long the next game will take. It is quite a bit bigger than TB. [Fuzzpilz] But it's also less messily coded and more modular, for lack of a better word. [Ghormak] It has some pretty neat things in it only Fuzzpilz could have coded. 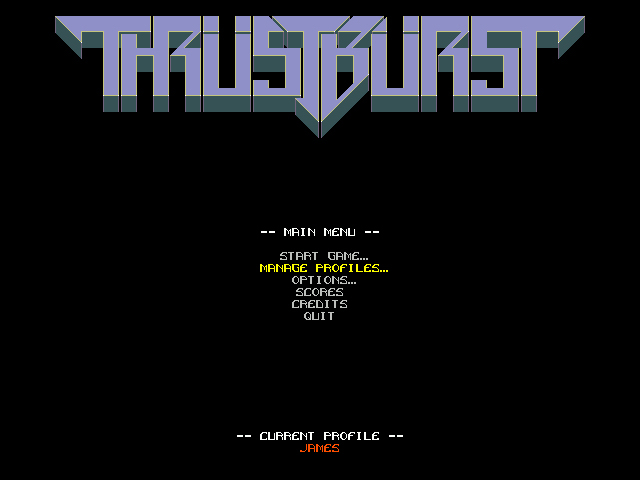 I do a bit of C++ coding, and could possibly have created something like ThrustBurst eventually through lots of trial and error, but game two is way beyond my skills. [Fuzzpilz] It's not that amazing honestly. [Ghormak] It is to me! [Fuzzpilz] That's not a particularly novel combination as such, Helm! Any hints as to what kind of game the next release will be? And following the support and acclaim TB has received, will your future work continue to be free, or do you intend to sell them as shareware? [Helm] James, they are 2D games, both of them. They tackle the concept of a platformer in very, very different ways. [Ptoing] Freeware all the way I would say. [Helm] I think freeware is the way to go too. Finally, with regard to the independent gaming and remakes scene, are there any recent releases that have captured your attention? What have you been playing over the past month or so that you'd recommend? [DarkStalkey] Still Dwarf Fortress, I'm sure! We all love that, but Helm is too unhardcore to play it. [Ptoing] I am too unhardcore as well - It confuses me to no end. Also, I would prefer not to start dream in Ascii. [Ghormak] Dwarf Fortress is amazing, though I don't play it much. I loved Knytt Stories and even made a level for it. [DarkStalkey] Oh yes, Knytt Stories is lovely. A lot of our friends did levels for that too. [Lackey] I play Knytt stories and made a level for it too. I don't play many games really. [Ptoing] I have not played too much as of late at all. I think the last indie game I played a lot was Blocksum, which is one of the best action puzzle games ever. [Helm] Oh! I really like a game called Xop Black, it's a manic shmup that is both one of the best designed of its kind (as far as indie games go) and also one of the most gross-looking (I mean this in a good way). I play a lot of A.D.O.M, this will never change. I like some of Cactus's games, really looking forward to his current cartoon project. I could never get into Dwarf Fortress like everybody else in our group. Knytt stories is amazing though - Nifflas is coming to dinner at some point to meet us all, definitely. [Fuzzpilz] I've been busy with university stuff of late - what gaming time I have goes to Dwarf Fortress and, and this is going to cost me ever so much indie cred - Team Fortress 2. [Ghormak] Haha, indie cred! (I play Team Fortress 2 too). [DarkStalkey] Me too. We invade servers and Ghormak puts us to shame mostly. [Helm] Oh no, our indie cred! [Fuzzpilz] We're all about fortresses here. [Helm] We also love Nikujin. Very much. [Fuzzpilz] I liked Knytt Stories also, although that's a fair while back, but I play Nikujin more so. [Helm] Ghormak has the world record for the training stage in Nikujin. Check YouTube. [Ghormak] Scotch beat me by one second, but he didn't record it... So yes, I guess I hold the record! [Ptoing] Haha I would not be sure if it is the world record, but it's pretty good. [Helm] IT IS THE WORLD RECORD. [Ptoing] There is probably some Japanese person who can do it in 20 seconds. [Helm] Japan is not in... the... world. [DarkStalkey] I've also been playing Nikukin and N.
[Helm] Oh yes, N I love as well. [DarkStalkey] N+ is brilliant on XBLA. [Lackey] I play Mount & Blade a lot. [Fuzzpilz] Oh yes, Mount and Blade. [Helm] Oh we all love Mount and Blade too, yes. [Ptoing] I have not played Mount and Blade. Maybe I should or the team might expel me at some point. [Ghormak] That's because you need a PC from 1996 or later to run it. [Helm] Ptoing likes Fantastic Blood Boy by one of the most wonderful pixel artists I know, Gustav, but I've yet to try it. [Ptoing] Oh yeh, I forgot that. Fantastic Blood Boy is awesome. [Helm] Dino Run was awesome too! [Ptoing] Helm and I also both like Cho Ren Sha 68k a lot. [Lackey] I played that before I knew you guys. Neat! [Ptoing] I even contacted the programmer of CRS68kto ask for the OST, and the musician sent it to me for free. [Fuzzpilz] For shmups, the last one I played that I really got into was probably Garden of Coloured Lights. [Helm] Garden of Coloured Lights ate up afternoons for me too! [Ghormak] I'm not a big fan of shmups really. I want to fly my spaceships slowly and in a depressing solitary environment, not in a hectic lightshow. [Ptoing] A really obvious indie game I like (and the others too I think) is Cave Story, but everyone should know that one by now. [Helm] Pixel deserves a lot of love for Cave Story. Never too late to mention it. [DarkStalkey] Indeed. It's brilliant in all respects. The music is classic! [Fuzzpilz] It's one of the greats. Still haven't quite beaten the secret ending, though. [Ghormak] I didn't like Cave Story much... But I'm the only person in the world with this opinion. [Fuzzpilz] Warning Forever is wonderful. [Helm] Oh yes, Warning Forever, amazing in every respect. [Ghormak] Warning Forever is a bit of an Umlaut favourite. [DarkStalkey] This is the longest part of the interview! Big up the indie scene! Have we missed anyone? [Lackey] We've probably missed tons. [Ptoing] Yeah, there are too many good indie games out there to mention. [Helm] But there aren't too many that have staying power, really. [Fuzzpilz] Thank you for liking ThrustBurst. [Helm] Thank you for the interest. We're very happy to have done this interview. [Ptoing] It was a pleasure. [DarkStalkey] We made it for you! [Lackey] Yes, thanks for the interest! [Ghormak] Thank you for thrusting the burst. [Lackey] Or is it bursting the thrust? [DarkStalkey] Try to thrust, old man. [Fuzzpilz] Try not to burst, old man? [Ptoing] Thrust to burst, old man. [Helm] We never really mentioned how the whole game is a Freudian metaphor for impregnation! [Lackey] Leave that for last. [Helm] Entrance Follies medal = SPILLAGE OF SEED. [Fuzzpilz] That works considering you have to play about a million times before you make it to the core. One ship wasted for every sperm that doesn't make it to the egg. And yet you keep thrusting because it's fun! All this time I thought the purpose was to *stop* the asteroid! [DarkStalkey] Actually, why are you blowing up asteroids? [Lackey] For all you know they just hate asteroids. [Helm] The storyline is left purposefully vague. Nothing would hurt this game more than a SUPER-SERIOUS scrolling intro text about the fate of humanity.